I was tapped to assist the Sunset Overdrive Design team in Burbank by taking on some side quests in the game. These side missions consisted primarily of fetch quests, which have a hard time being more then ho-hum experiences. I wanted to try and make some of the quests as interesting as I could with the short time limit and limited support that I had available. For some quests this meant cobbling together new mechanics and assets out of existing assets to prove a design worked or to create an asset. Some of the assets I created ended up making it into the final game. IGN's video guide of the Sunset Overdrive Quest: Hepcat Upgrade. This quest was one of my favorites. Sunset Overdrive didn’t have any moving cars in the game before this quest existed. 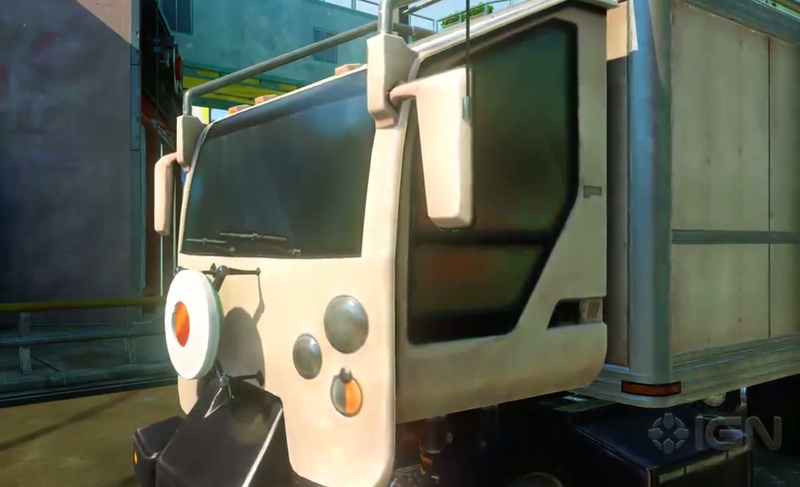 I thought it would be cool if the player had to pick up barrels of Overcharge hidden around the Harbor district, carry them back to and toss them into the back of a waiting van and then be able to ride that van to the next location while blasting baddies along the way. Seemed like a fun way to explore the neighborhood! The lead creatives dug the idea but were concerned with the possible complexity. I needed to prototype the idea with what I could find / create on my own in a short amount of time. Challenge accepted! First I needed a moving vehicle. 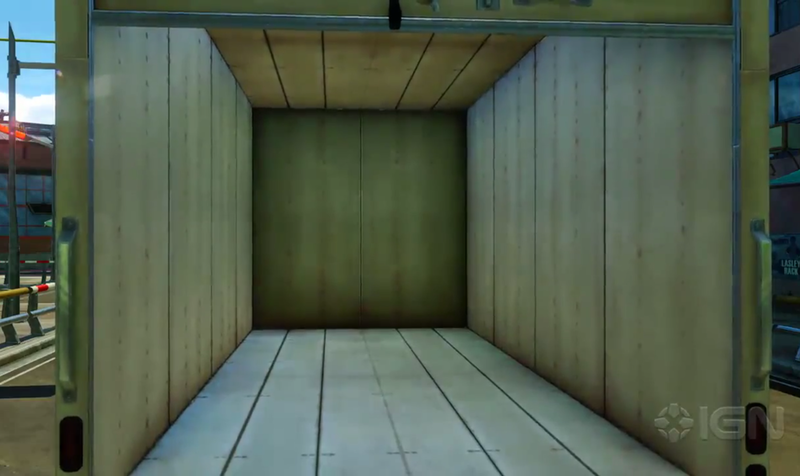 I took one of the static vans placed around the game, opened it in Maya and removed all the shelving in the back. I then edited the van to turn it into a mobi (a game object that can be manipulated for gameplay purposes, like attaching animations, etc). Next I found and reused a barrel pick up / throw mechanic that was used for a different mission and hooked it up to work with the cargo area in the back of the van. So now I can pickup a barrel and throw it into the back of the van. At this point I ran some people around the office through a test to see initial reactions and make any adjustments needed. Now I needed to get the van moving around the level! With the van being a mobi I could create and attach a path that ran a course through the harbor district. I created a script that would move the van from point to point along that path after it detected a barrel being tossed in the back. All that was left was to setup enemies around the barrels and I could start testing the quest. I ran people around the Durham office through the quest and people back in Burbank also experienced it, thumbs up all around and the quest was given the go ahead for production. It received further polish and the van got an awesome driving animation from one of the animators in the Durham, which is what you see in the game. I also wrote the initial quest narrative and polished it further with the writer back in Burbank, CA to make sure it all worked. Pretty happy with how the whole thing turned out. IGN's video guide of the Sunset Overdrive Quest: Boat Upgrade. IGN's video guide of the Sunset Overdrive Quest: Theater Upgrade. For the Take Back The Street’s side quests the player had the option to take back each each of the districts from FizzCo. Instead of just killing some guys and calling it a win I wanted the player to have a layered goal. 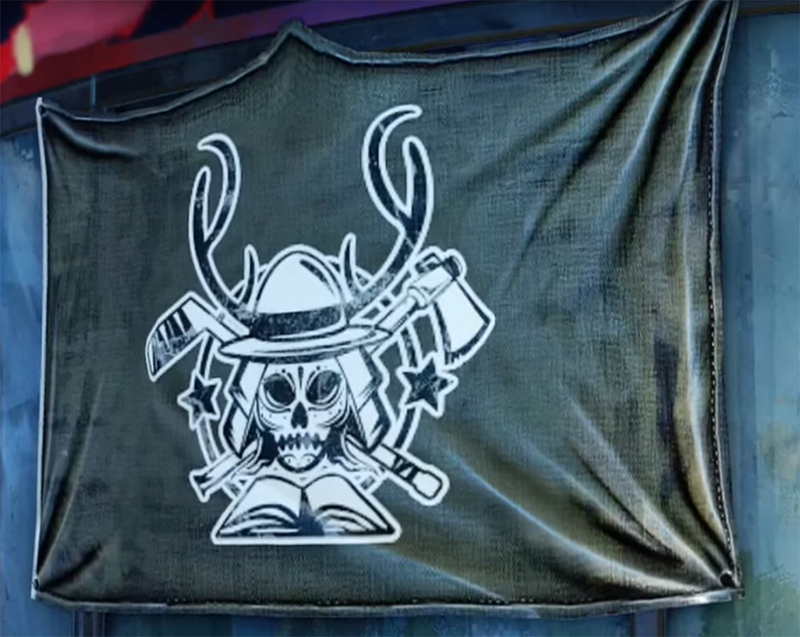 They need to take down the FizzCo flags that had been flying high the whole game and raise their own unified clan’s flag. which myself and one of the artist came up with. I then hung the flag on the base wall, which is seen in the cutscene. I created the model for the mechanism the player uses to lower / raise the flags by re-purposing and modifying the train track directional device the player uses in a different mission. An artist did a retexturing for me. Of course, FizzCo wont like this act of aggression and will try and stop the player from swapping flags. A another designer had the idea to add the fireworks after a flag was raised to celebrate the event. I really had a wonderful time designing these these side quests with my group in the Durham, NC office and the main Sunset group back in Burbank. CA. IGN's video guide of the Sunset Overdrive Quest: Take Back the Streets: Old Factory District. IGN's video guide of the Sunset Overdrive Quest: Take Back the Streets: Little Tokyo. 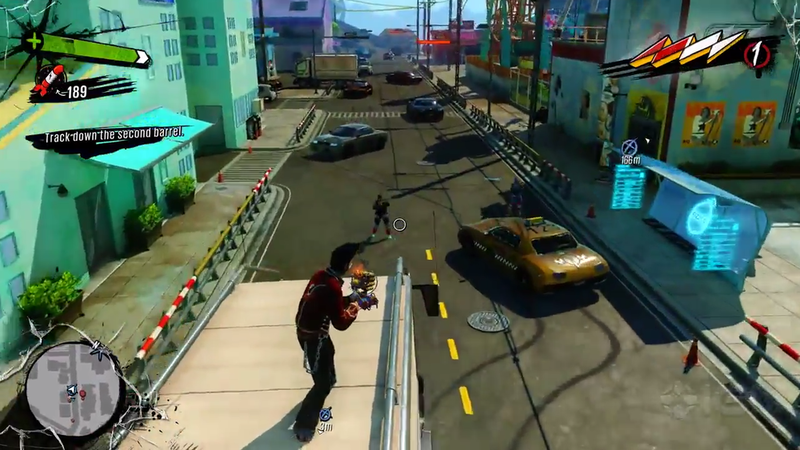 IGN's video guide of the Sunset Overdrive Quest: Take Back the Streets: Harbor.